(1) Why fish the Restigouche River? The Restigouche River is recognized as one of the top ten Atlantic salmon fishing rivers in the world. During the early season the Restigouche River hosts a run of very large Atlantic salmon that equals any river in the world. People come from all over the world to experience the fishing in one of the most productive and beautiful locations in North America. The lodge offers a combination of superior accommodations, delicious food, and experienced guides that insure complete satisfaction during your visit. (2) What other species of fish are caught in the Restigouche River? (3) Where is the Restigouche River Lodge? The Restigouche River Lodge is located in the Canadian province of New Brunswick, near the villages of Matepedia and city of Campbellton. (4) How do I get to the Restigouche River Lodge? Please refer to “Directions” in Trip Planner in the home page navigation bar. (5) What documents do I need to enter Canada? If you are a US citizen, you must have a valid US passport in your possession. If you are a citizen of another country, in addition to your national passport, you may also need a visa to enter Canada or re-enter the US. Please refer to US and Canadian Customs for further information and changes sufficiently prior to your travel date. (6) What fishing license do I need? On the Restigouche River both New Brunswick and Quebec fishing licenses are honored. The Restigouche River Lodge has on hand Quebec live release fishing licenses for guests to purchase at a cost of forty dollars paid by cash. There is also a Zek office in Matapedia where guest may also purchase their license for use in Quebec of a different type. (7) Do I need to bring fishing gear? Please refer to “What to Bring” in Trip Planner in the home page navigation bar. Although most anglers prefer to bring their own fly fishing gear rods, reels, waders, and clothing. We will be glad to assist you with any of your gear needs. The lodge has rods, reels and gear at the lodge, just contacts us before your trip and we will make sure you will have what is needed. (8) Will the lodge accommodate special dietary requirements? The kitchen will be happy to assist you on your specific Dinning needs, Please let us know of your dietary requirements before you arrival to the lodge. (9) Are telephone, fax and internet service available? While at the Restigouche River Lodge you should be able to experience excellent cell phone service, my carrier is Verizon and there is never a problem. It is recommended that you contact you carrier for and special packages that you might need prior to your trip. Wy-Fi is available for your convince while you are at the lodge. We have preferred not to bring in cable television at the lodge, the feeling is that it would tend to spoil the lodge experience for you and the other guest. Let’s fully enjoy the comradery, fly fishing, tying flies and other activities at the lodge for a total Atlantic salmon fly fishing lodge experience. (10) Will 120v/60 cycle electrical appliances work at the Restigouche River Lodge? Yes, conventional 120 volt, 60 cycle US appliances will operate at the Restigouche River Lodge. (11) What should I expect for weather? One of the most asked questions, the weather conditions can vary greatly from the time of the season you have booked your trip and during the week itself. Our season runs from mid-May to the end of September and the day and night temperatures are related to the week and month of your trip. Weather conditions vary differently from season t0 season and year to year so contact us prior to you trip for current conditions or check the latest weather on the internet. (12) Can I bring my wife and children? It is the desire of the Restigouche River Lodge to increase our occupancy availability. Currently we can accommodate ten guests at the lodge. Therefore non fishing guests are welcome at the lodge by availability and at a non-fishing price. Later in the season we tend to fish less rods which creates more opportunities for non-fishing guests. (13) What is included in the rate? (14) Can I buy flies at the lodge? 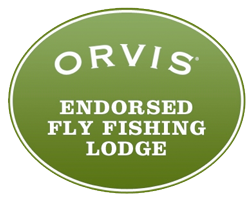 At the lodge you can purchase the highest quality flies tied on the strongest hooks available by our Master Tier Scott Doncaster from New Brunswick. The flies, sizes, and style of hook from singles, doubles, tubes and Waddington shanks are on hand at the lodge for the time of the season and the water conditions when you’re fishing with us. We also have available hand tied leaders, sinking tips, tippet etc. In the near future we will hope to be adding a pro shop. 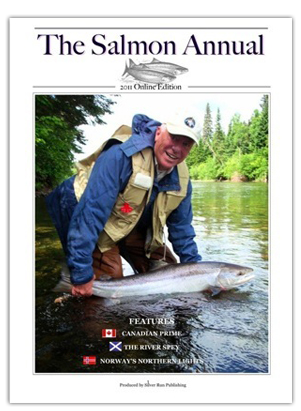 (15) When is the best time of the year to fish for Atlantic salmon? (16) Can I keep my catch for dinner? 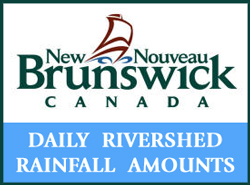 In New Brunswick Mature Atlantic salmon are protected and must be released back safely in the river. It is the lodge’s policy to release all salmon including grilse. These Atlantic salmon and all salmon are very precious and unique to their rivers. If we want to land more Atlantics and have them attain their maximum weights while preserving the species we must protect them.